Ham, Cheddar, Butternut Squash, and Green Chilies Wrapped in Flaky Sour Cream Pastry. 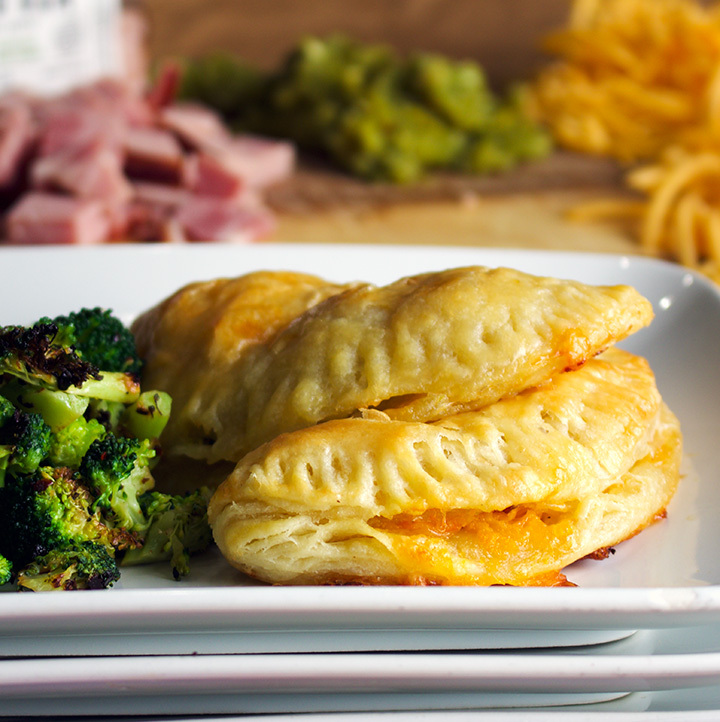 Applewood smoked ham, sharp cheddar cheese, butternut squash, and spicy green chilies wrapped in pastry that’s nearly as buttery and flaky as a croissant. This is the type of appetizer/ party food that you can also make a meal out of. Hand pies, naturally, are easily eaten with your hands, requiring nothing more than a cocktail napkin. 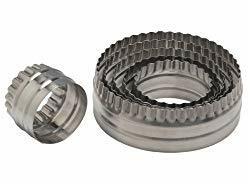 They are also an excellent addition to a buffet table spread with a variety other small plate style dishes. They make an impressive appetizer for dinner party guests and a welcome addition to Sunday morning brunch. Or, pile two or three on a plate with a salad or sautéed veggies, and you have an entire meal. What I’m saying is this: After making these for one thing, you might want to make them for everything. A while back, I read that adding sour cream to pastry dough creates a super flaky baked crust, a claim I was skeptical about, but curious enough to give it a go, and happy to discover that it’s completely true. This recipe creates pastry so flaky it’s croissant like. 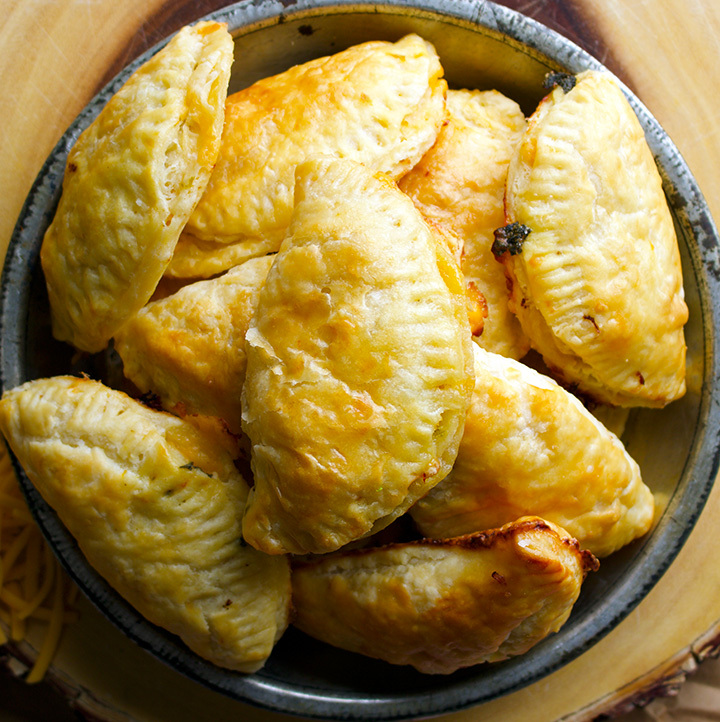 I’m a fan, and have already started using it in other recipes – like Apple Butter and Pastry Cream Hand Pies. Let’s Talk Ham and Cheese. Ham and cheese is always a good idea as long as it’s good ham and good cheese. I used an applewood smoked variety, but use whatever you like as long as it’s good quality and flavorful. I really like sharp cheddar cheese in these hand pies. 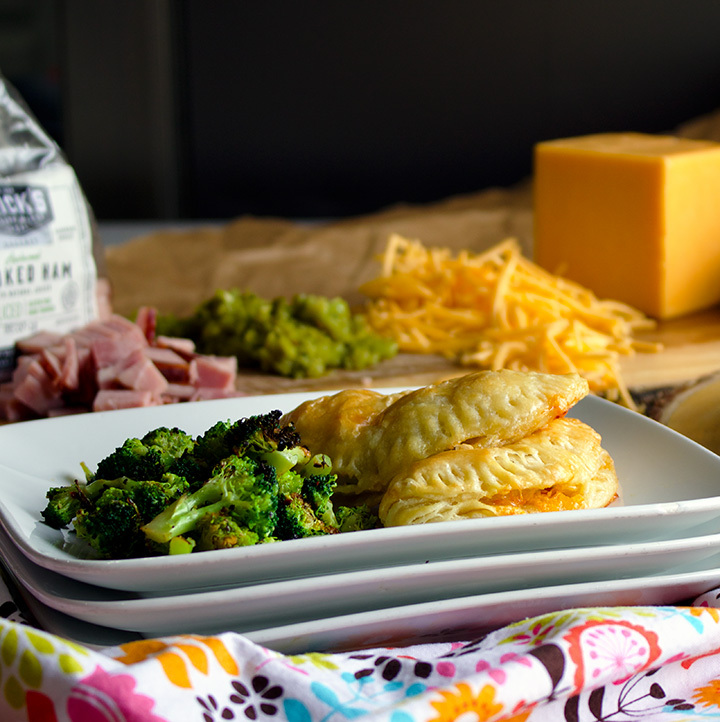 The other filling ingredients are richly flavorful and mild cheddar will just get lost in there. As with the ham, use a cheese that’s tasty enough you won’t be able to help yourself from snaking on a piece or two. 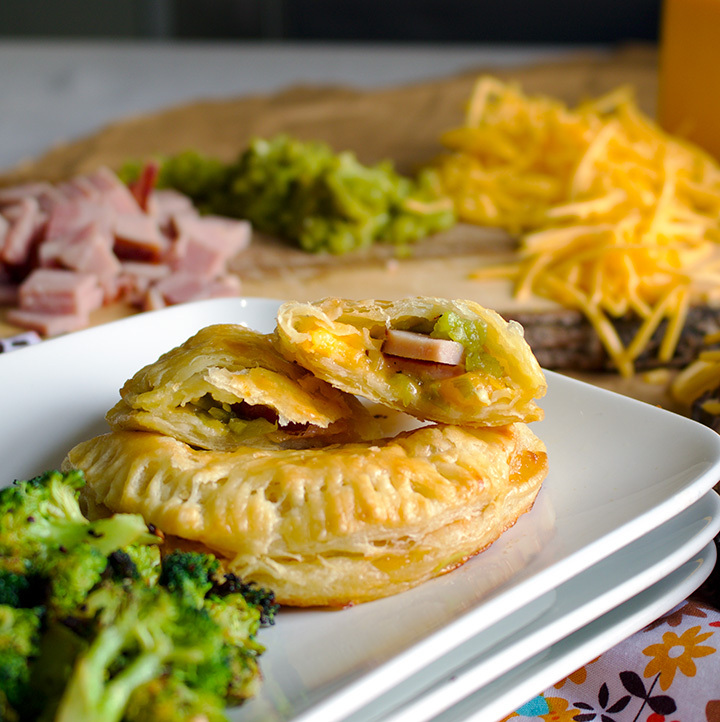 These savory little pies would be perfectly delicious made with only ham and cheese. The butternut squash and green chilies are a kind of gilding the lily, but in the best possible way. Leave them out, and no one will know what they’re missing. Add them in, and everyone will think you are a hand pie genius. 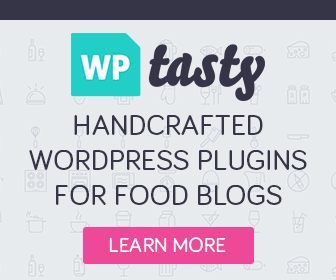 They are the kind of ingredients that add layers of flavor you didn’t know you needed until you taste them. Pie for dinner? Yes, please. 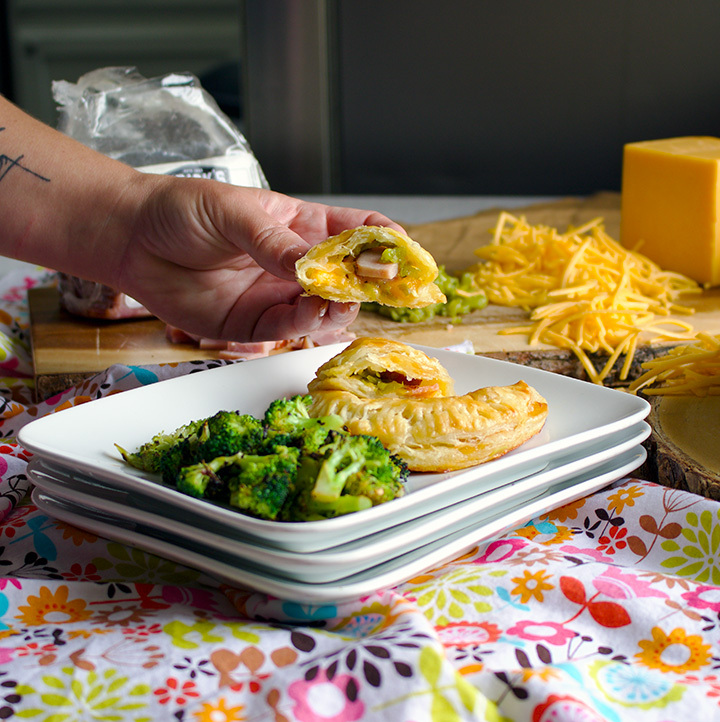 Add a salad or some sautéed veggies and make a meal of these little ham and cheese hand pies. Sautéed vegetables are a quick and easy way to add vegetables to a meal. 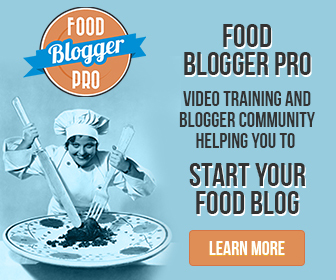 The trick is to slice them uniformly and then cook them quickly in a very hot pan with a minimal amount of oil. Quickly sautéed broccoli with a dash or two of crushed red pepper is a favorite at our house, but use whatever veggies strike your fancy. Heat the oven to 350 degrees and line a baking sheet with foil. Put the butter in a small saucepan set over medium heat. Cook the butter until it is golden brown; watch carefully – you want the butter to brown but not burn. Remove from the heat and stir in the fresh sage leaves. Slice the peel from the butternut squash and remove the seeds from the center. Cut the squash into small cubes – about 1/2-inch thick. Add the cubes to a bowl, pour the sage butter over the top and toss to coat the squash in the butter. Spread the squash out onto the baking sheet and sprinkle with a generous amount of salt. Roast in the preheated oven until the squash is very tender, about 20-30 minutes, depending on the size of the cubes. 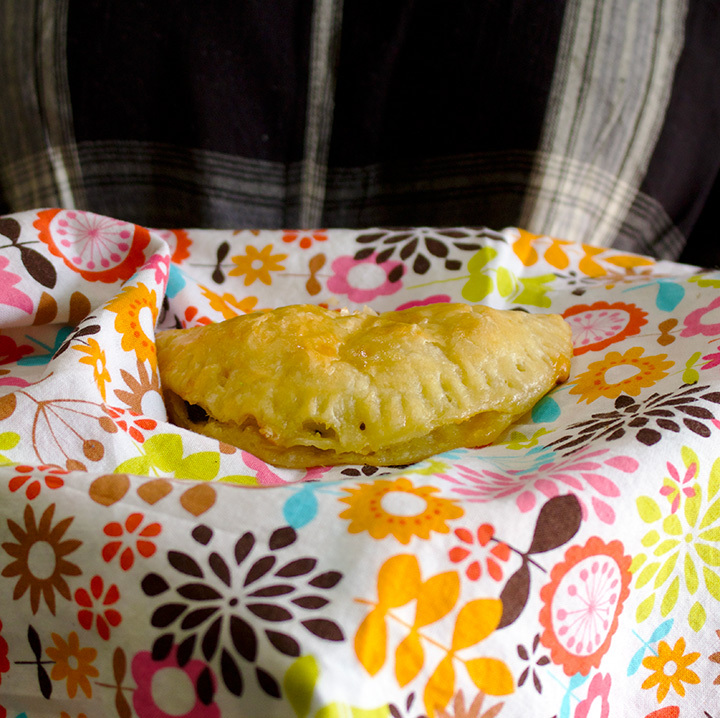 Let the squash cool before using in the hand pies. Line a large baking sheet with parchment paper and remove the pastry dough from the refrigerator. Lay the circles on the parchment lined baking sheet and distribute the cheese, ham, green chilies, and butternut squash amongst the pastry circles, layering the ingredients on one side of the circles. Fold the dough over the filling to form a half moon shape, press the edges together gently with your fingers, then press the edges together with the tongs of a fork to seal. Cover the pies loosely with plastic wrap and refrigerate for at least 30 minutes, and up to 12 hours. In a small bowl, whisk together the egg and teaspoon of milk. Remove the pies from the refrigerator and brush the tops of the pies with the egg mixture, using a pastry brush. Bake the pies for 35-40 minutes, turning the sheet around in the oven about halfway through baking, until the crust is golden. Follow Frick’s Meats on Facebook and Instagram. By posting this recipe I am entering a recipe contest sponsored by Frick’s Meats and am eligible to win prizes associated with the contest. While I was not compensated for my time, I did receive free product samples. As always, all opinions are my own.